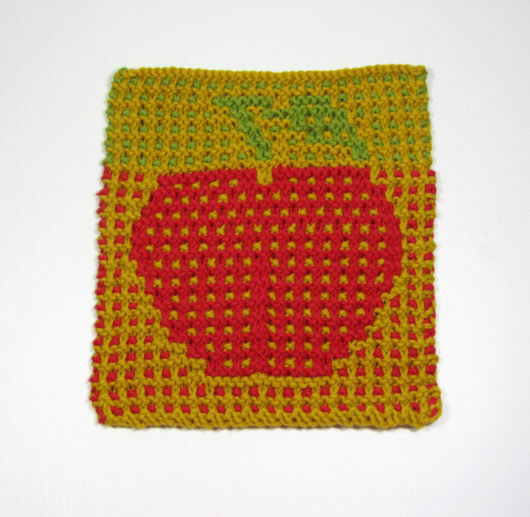 These are Amy Marie Vold’s a/k/a Ravelry’s CornucopiAmy’s Fresh Knit Apple dishcloths. I knit mine in DROPS Paris. Most of my cloths are gifted to friends and family. These made me want to keep a few for myself. First up is a nice red Delicious Apple. This one’s a Golden Delicious, I think. 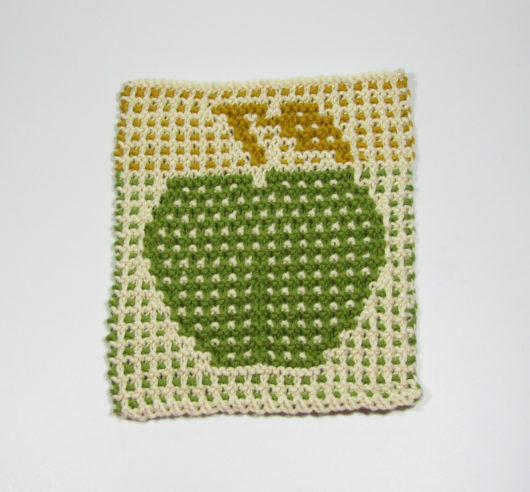 And, here’s a Granny Smith. 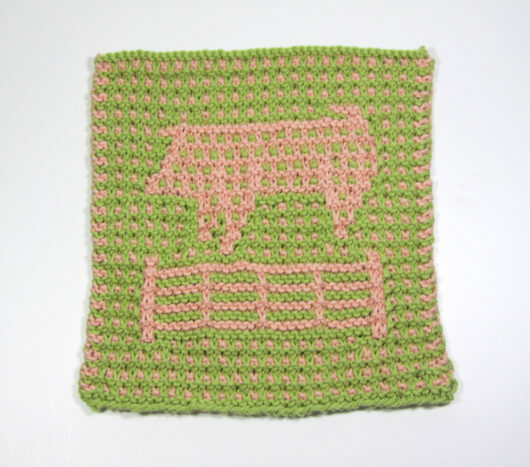 These easy slip-stitch cloths are tons of fun to knit. If you’ve not tried this technique before, Vold’s instructions are clear and there are many videos on the web that teach the technique as well. It’s also known as mosaic knitting. Better yet? Have a friend show you, once, and that’s all you’ll need to be off to knit your own. 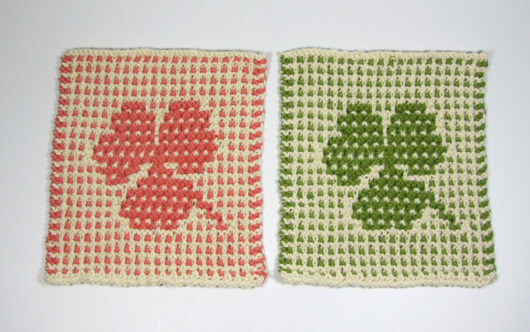 If not apples, how about a Cloverleaf Cloth? My Piggy is sort of hiding in the spring grass. But you’ll make a better color choice and your piggy will pop. Looking for an edgier cloth? 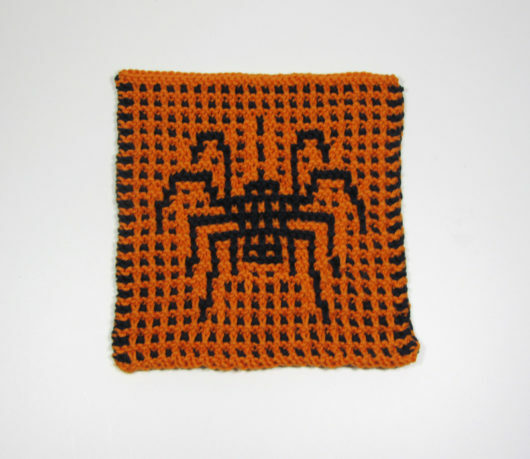 “Along Came a Spider” could be just the ticket. I think this next one is a Brown Recluse. From edgy to a bit cartoony. 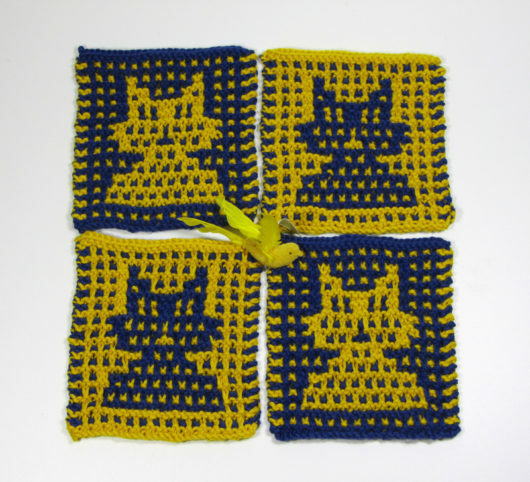 The next set is “Window Patrol Cat Coasters.” I’ve got a “Go Blue” Michigan Wolverine colorway going, because that’s all the DK weight I had in my stash at the time and I live in Michigan so it’s forgiven. These cats are definitely eyeing that little yellow birdie. 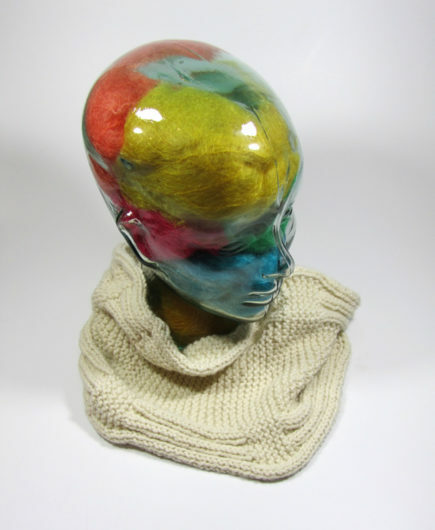 There are a lot of major and splashy talents in the knitting universe. 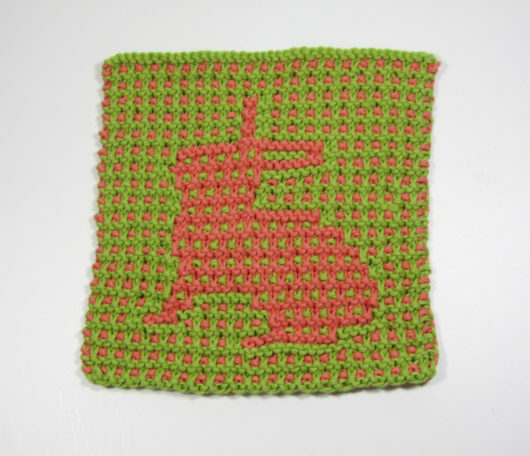 In the smaller knitting world of dishcloths, Vold stands out. 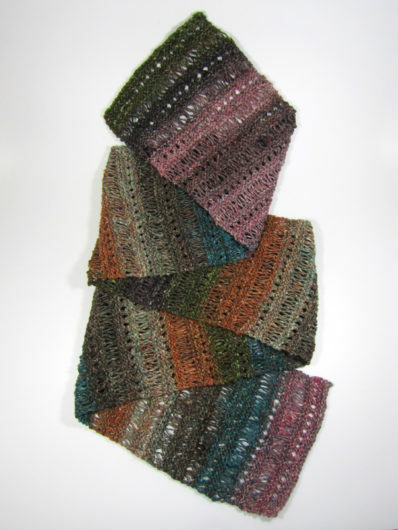 This is Aimie Alexander’s Antonia’s Scarf. In her Polka Dot Sheep Stumptown DK it looks very refined and totally sweet. Check it out here. In my version, knit in Noro Yuzon, it lost its sweet. It turned out definitely more savory. Yuzon is a 56% wool, 34% silk,10% mohair DK. And where that mohair is hidden, I surely don’t know. 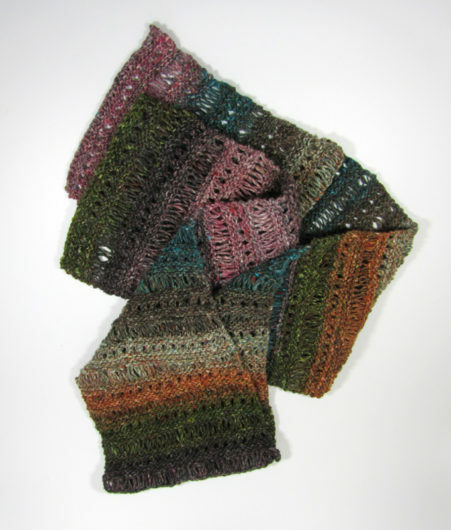 My version of Antonia’s Scarf is not next-to-skin soft, but I love the color-changing quality of this yarn. Softness can be overrated. I plan to recommend that the wearer keep it on the outside of her coat. I cast on 35 stitches instead of 29. Without stretching at all, and with a light steaming, mine is 65 inches long. This thing grows on the needles faster than bamboo. 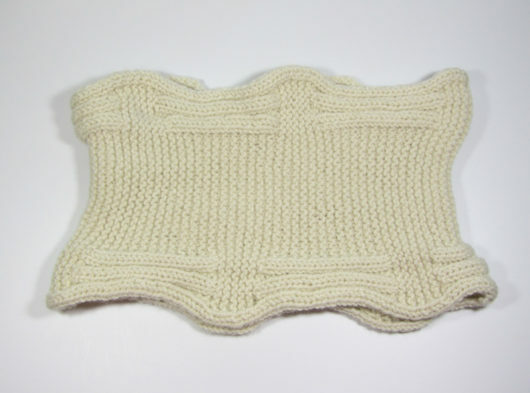 The elongated stitch does wonders for the time it takes to knit a scarf. Spring is finally arriving here in Michigan. We’ve got buds on the trees to prove it, though nighttime temps are in the mid-30’s. But I’m still working my way through a nice wintry mix of knitting. 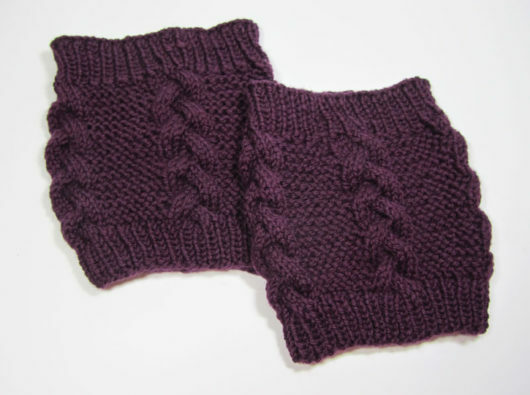 Here’s a pair of Paved boot cuffs, by TinCanKnits. I even polished my boots to show them off. Actually, I didn’t. These boots hurt my feet so I don’t wear them. 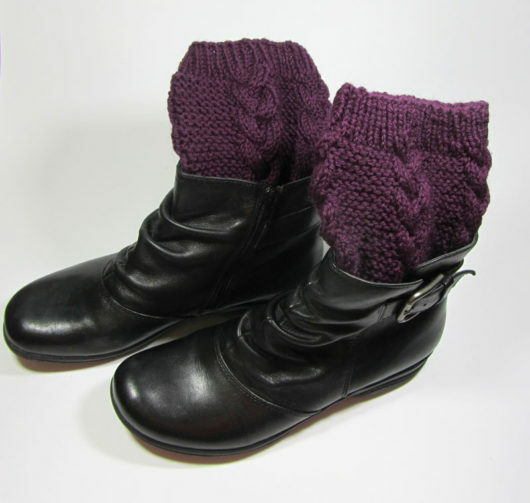 They make a nice photo prop for showing off, well, boot cuffs. My cuffs are knit in Brown Sheep Nature Spun worsted. 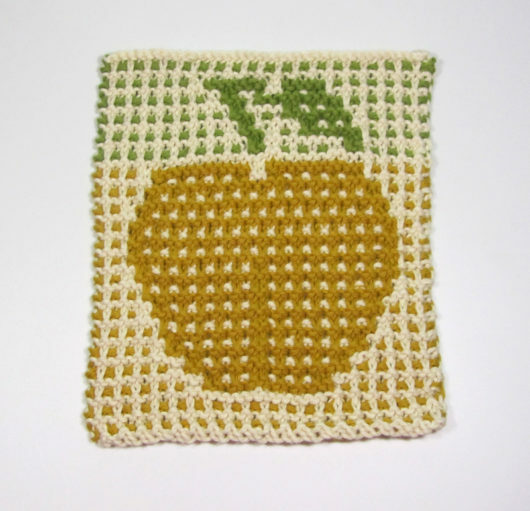 Over the years I’ve had great success with TinCanKnit patterns. 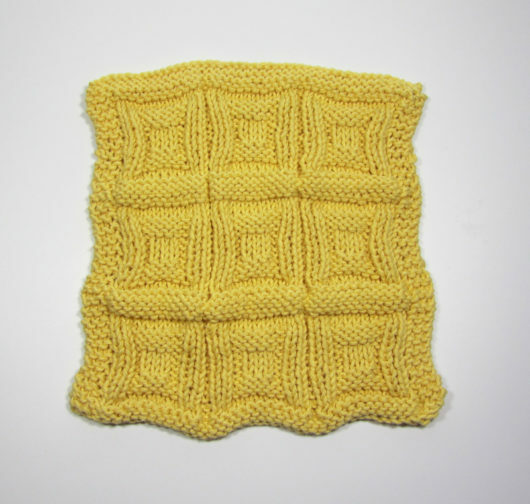 They are well-tested– before, not after– we knitters buy the pattern. 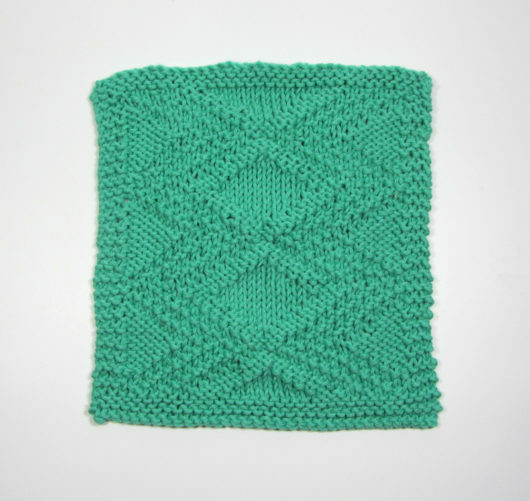 The patterns are usually straightforward enough for newer knitters, but with interesting design features to keep more experienced knitters interested too. I have never worn boot cuffs. To me, they seem an odd accessory. I gave this pair away. But maybe someday I’ll make a pair for me and see if I take a shine to them. I see the slight assymetry. The reversibility is very nice. And knit up in Blue Sky Extra, a 55% Alpaca, 45% merino Aran weight, it definitely is completely cozy. I knit the shorter version. In the longer version, you knit enough to make a double loop or a nice long dangle. Glasshead isn’t exactly seeing the notched parapet. But no matter, because this is one excellent cowl. 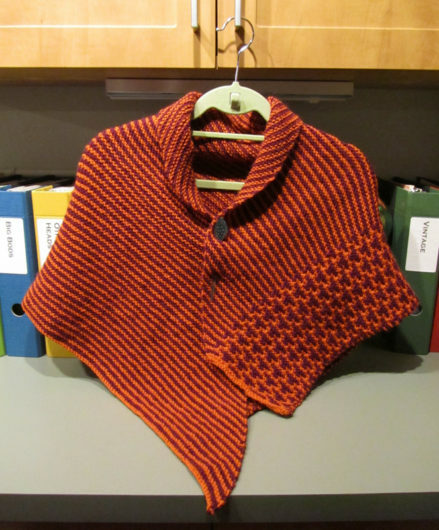 This is one of my new pretty things: Rusted Roof Shawl, by Martha Wissing. 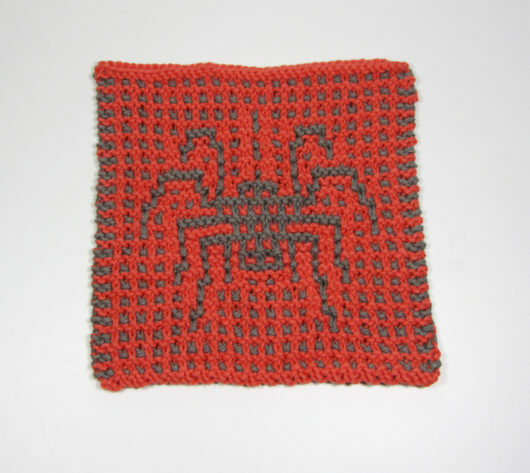 It’s available for purchase here on Ravelry. Rusted Roof, not to be confused with one of the best bands ever, Rusted Root. The recipe for Rusted Root is a blend of rock, acoustic, world, and heavy percussives. 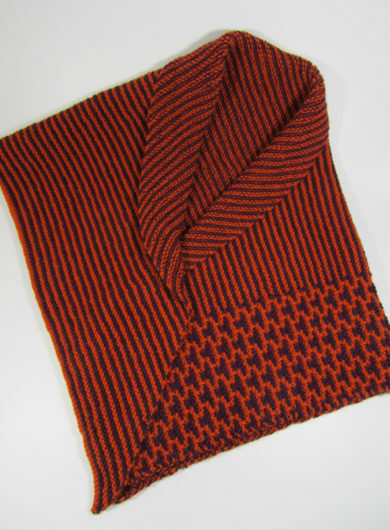 The recipe for Rusted Roof is to take two highly contrasting worsted weight colorways and just set to knitting. I knit mine in Berroco Ultra Alpaca in carrot and eggplant. Sometimes I do think I choose colors mostly to entertain my eyeballs while I knit, but I’ve actually worn this in public and gotten apparently sincere comments that folks like it. 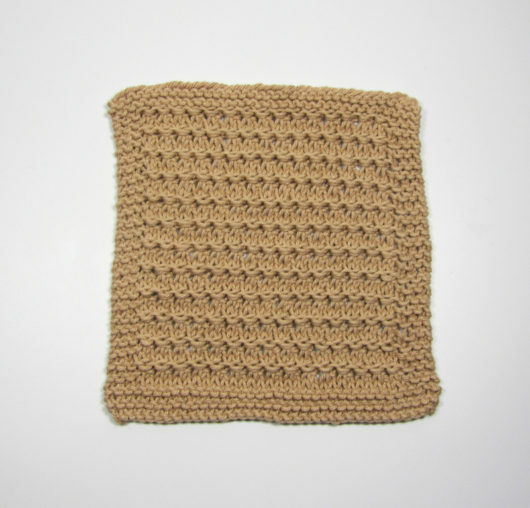 The patterning on the edge is mosaic stitch a/k/a slip stitch. It’s super easy. A lot of bang for your knitting buck. I love the way the interior edge can be curled back to fashion a collar. This photo was taken on April 3rd. It had been warm. It had been cold. It had snowed only a few days before. It had rained. Near the shore, the first few feet of water was clear of ice. The ice finally stopped its vocalizing. 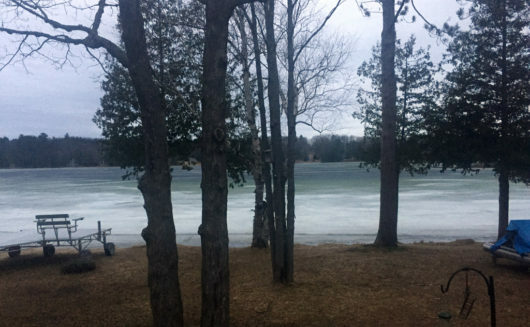 Everywhere else on the lake that we can see, except close to shore, was still covered with ice. The ice in the shallow water was frothy. Almost snowy looking. And the ice over deeper water was already showing the color of the water underneath. A few days later. No ice. Soon Jeff will be out fishing. The kids will be tubing. And we’ll be checking on Ghost Bay and the Narrows keeping our fingers crossed that the beavers didn’t munch too many birch trees this winter. 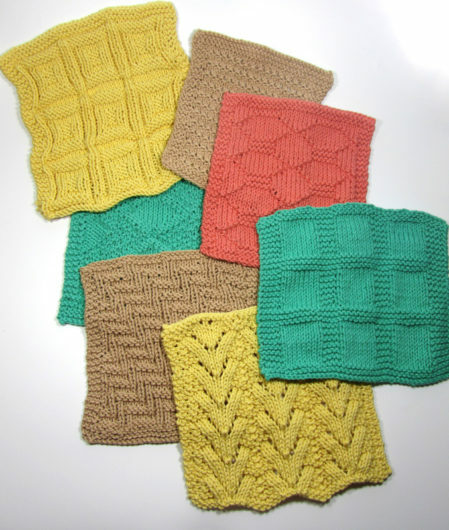 Each of these cloths is from Deb Buckingham’s great book: Dishcloth Diva. 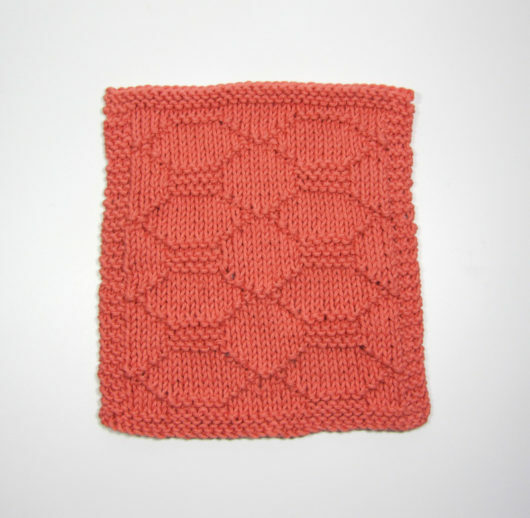 She’s already released Dishcloth Diva II–but I didn’t find even her first book until Steve gifted it to me this past holiday. Let’s see, from top yellow diagonally down to the bottom yellow and back up to the tan, it’s Neutrals, Cutting Edge, Organic, Glamour, Contemporary, Stonework, and Linear. 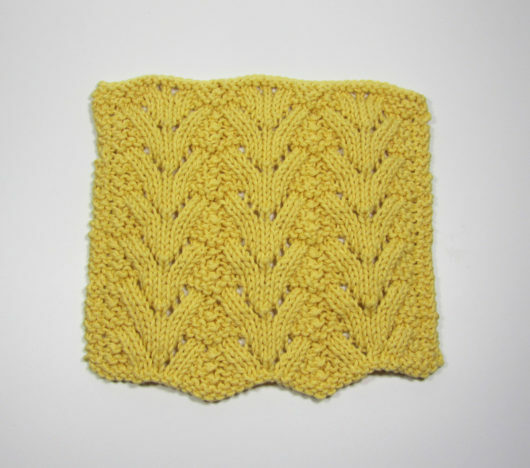 Most of my set is knit in Drops Paris (yellow, green, orange). And the tan ones are KnitPIcks Dishie. 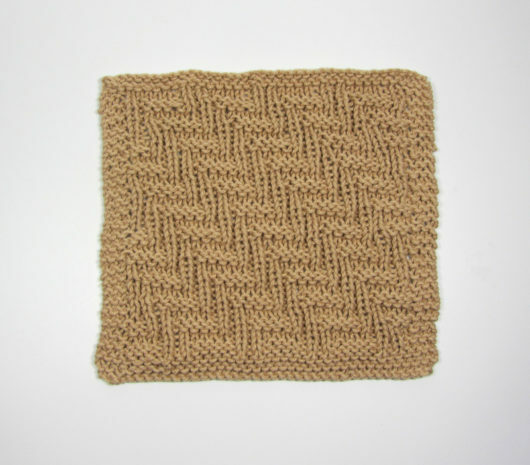 Both yarns are great dishcloth cotton. Paris has a little more body to it. Dishie is a bit more refined. These are obviously all very quick knits. You could knit the entire set of seven in a good solid weekend of knitting. Linear has great texture for doing whatever you have your cloths do: wiping away stuff in the sink or wiping away stuff in your spa. Glamour is a fun knit. I’m not sure I see the Glamour. But…maybe. There is sort of an Art Deco look to this one. I can definitely see Organic in a spa setting. I knit mine in Dishie, which isn’t an “organically” grown cotton. But you could take the plunge, pay tons more for the yarn, and surprise a friend with organic sensibilities. And this last one is Cutting Edge. 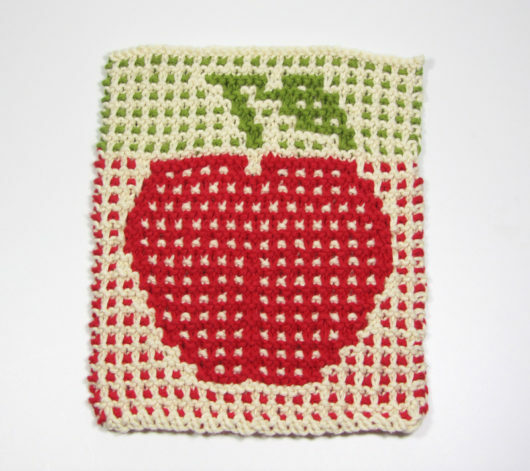 I don’t block any of my dishcloths. Not even if I gift them. 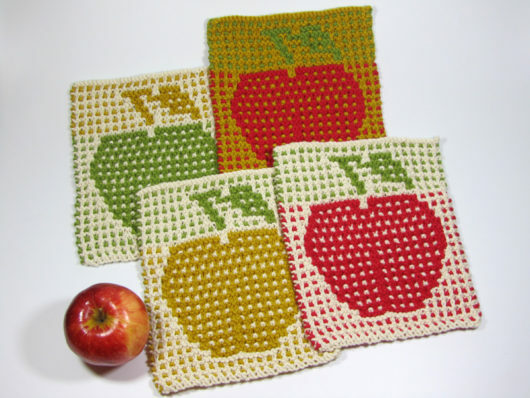 They are, after all, dishcloths. 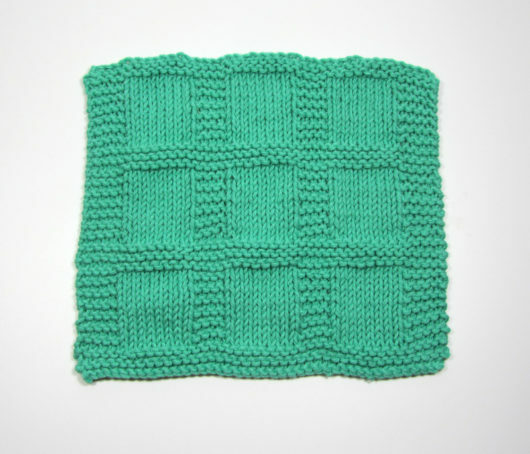 But if you’re more fussy, all of these will square up nicely with just a bit of blocking.